Dame Mary Barbara Hamilton Cartland was a English writer, during her long career, she wrote over 700 books, making her one of the most prolific authors of the 20th century. She sold over 1,000 million copies throughout the world, earning her a place in the Guinness Book of Records. The world's most famous romantic novelist, she also wrote autobiographies, biographies, health and cookery books, and stage plays and recorded an album of love songs. She was often billed as the Queen of Romance, and became one of the United Kingdom's most popular media personalities, appearing often at public events and on television, dressed in her trademark pink and discoursing on love, health and social issues. She started her writing career as a gossip columnist for the Daily Express. She published her first novel, Jigsaw, a society thriller, in 1923. It was a bestseller. She went on to write myriad novels and earn legions of fans, she also wrote under her married name Barbara McCorquodale. Some of her books were made into films. Ever the romantic, during WWII, she served as the Chief Lady Welfare Officer in Bedfordshire. She gathered as many wedding dresses as she could so that service brides would have a white gown to wear on their wedding day. She also campaigns for the rights of Gypsies, midwives and nurses. 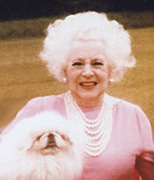 Barbara Cartland passed away on 21 May 2000, with 160 still unpublished manuscripts, that are being published posthumously.